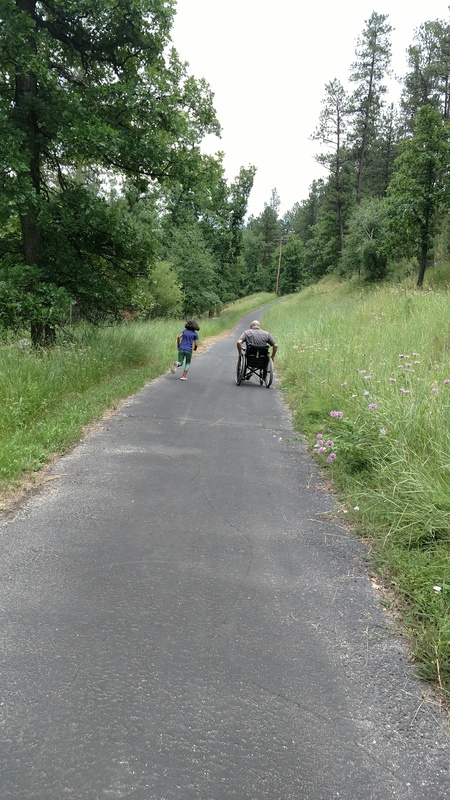 Home / The Black Hills are Accessible to All! 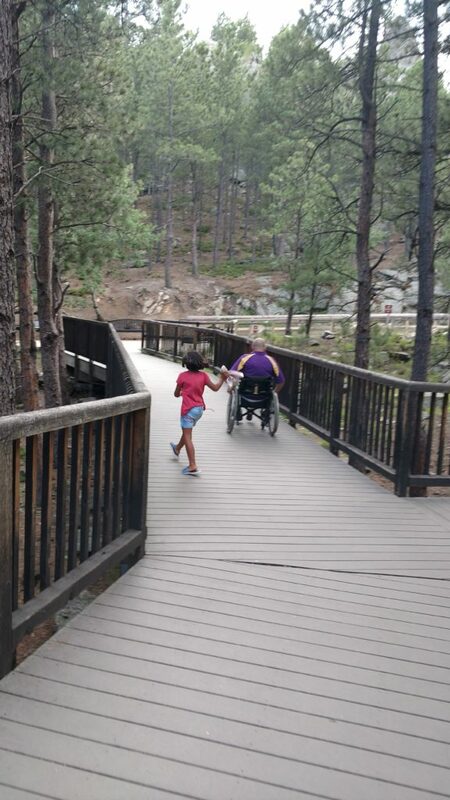 Three years ago, a life changing accident forced my active family to look for new ways to explore our beloved Black Hills. My husband was involved in a truck accident that resulted in a mobility impairment. When something like this happens, you really must re-evaluate life because ultimately you have some choices to make. Either you can let it affect your active lifestyle or you can move on and seek out new adventures! Fortunately, our family chose to move on and seek new adventures. Many of these new adventures are right here in the Black Hills. As a destination, we have found that the Black Hills region is quite accessible for those that have a physical disability. 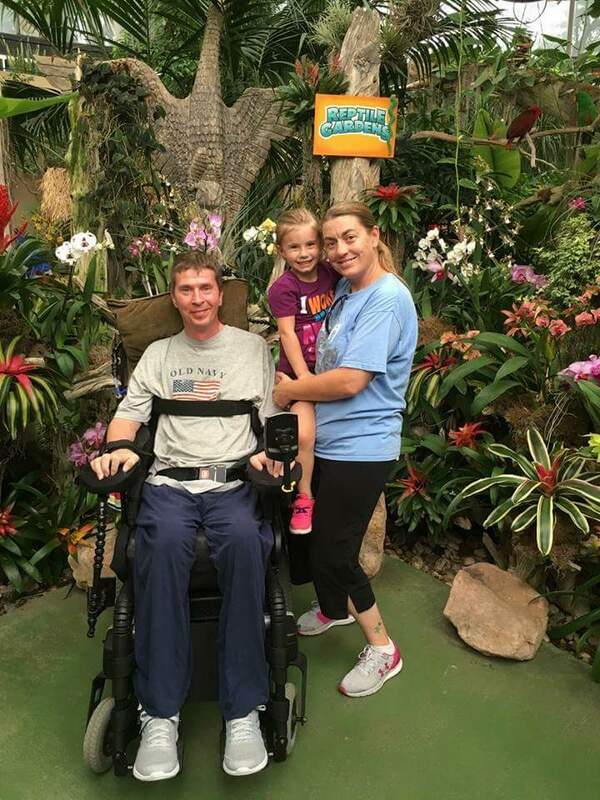 Carefully planning your vacation is something that all visitors should do before any trip, but when you are mobility impaired, you should be sure to research the destination and activities you are interested in doing. To help guide you through the Black Hills region, we’ve put together a four-day itinerary with a wide range of accessible activities to enjoy: Trails beneath Mt. Rushmore. 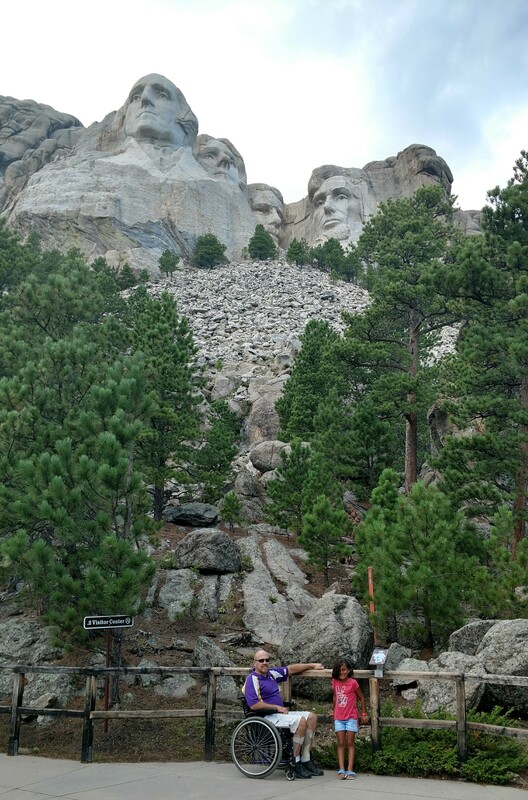 Day 1: Start your Black Hills adventure with a trip to Mount Rushmore National Memorial. Featuring the 60-foot faces of George Washington, Thomas Jefferson, Theodore Roosevelt and Abraham Lincoln—America’s Shrine to Democracy is simply breathtaking. It’s easy to spend a few hours exploring Mount Rushmore. When you get there, stop by the Information Center to grab schedules and information about the Memorial and consider renting the Mount Rushmore Audio Tour for $5. This tour will guide you throughout your visit with narration, interviews, and historical recordings. Continue through the Avenue of Flags and be sure to keep an eye out for your state flag. This will bring you to the Grand View Terrace where you will find the elevator to take you below to the Lincoln Borglum Visitor Center. This Center houses a museum that tells the story of Sculptor Gutzon Borglum and how the Memorial was created. Don’t miss the film, “Mount Rushmore, The Shrine,” which is shown every 20 minutes. Next, head to the Presidential Trail for some up-close views of the Memorial. This trail is surfaced and will accommodate wheelchairs from the Grand View Terrace to viewing areas at the base of the Memorial (the entire trail is not accessible). As you leave the Memorial, be sure to stop at Carvers’ Marketplace for some lunch or a “Monumental Scoop” of Thomas Jefferson's famed vanilla ice-cream. Trail beneath the monument. After your morning at Mount Rushmore, head to either Keystone or Hill City to climb aboard the 1880 Train. This relaxing steam train experience is a 20-mile, two-hour narrated trek that goes between Hill City and Keystone. 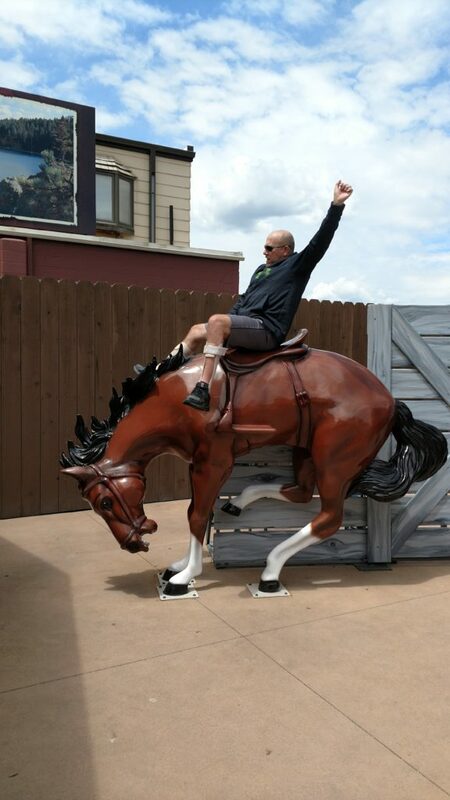 Advance reservations are a must for this experience, as they can only accommodate two wheelchairs per run. 1880 Train entrance ramp. Day 2: Get up early and head to Custer State Park. The park is most famous for its scenic drives and bison herds. Some can’t miss drives include the Wildlife Loop Road, where you can get up-close views of the bison and other wildlife; Needle’s Highway, which offers amazing views of the granite spires; and Iron Mountain Road, where you can traverse the iconic pigtail bridges and stone tunnels. After taking these scenic drives, stop at the State Game Lodge for lunch where you can choose to eat off the Lodge Buffet or perhaps try a buffalo burger or their famous buffalo stew. The accessible entrance and reserved parking is on the backside of the State Game Lodge. Creekside Trail along Grace Coolidge Creek. After lunch, stop at the Park Visitor Center, located at the junction of the Wildlife Loop Road and HWY 16. This state-of-the-art Visitor Center has an interactive park map, exhibits, and a theater where an incredible park film is shown. After enjoying the Visitor Center, go outside and hop on the Creekside Trail. This two-mile, hard-surfaced trail follows Grace Coolidge Creek and will take you past the historic State Game Lodge, Peter Norbeck Outdoor Education Center, Coolidge General Store, and the park office. We would recommend turning around at the park office as sections of the trail become rough and the grade is a bit steeper beyond this point. As you leave Custer State Park, stop at The Gordan Stockade. This interpretive site tells the story of a group of gold seekers that illegally moved into the Black Hills in 1874. They built a log fortress to protect themselves from a possible Lakota attack. This site is accessible with sidewalks and reserved parking. Day 3: Begin your morning at Jewel Cave National Monument, located just west of the town of Custer. When you arrive, stop at the visitor center where all their exhibits and displays are accessible. The interactive displays are very fun and informative. Next, it is time to go down into the cave. Jewel Cave offers an accessible tour called the Discovery Talk. This 20-minute tour takes visitors down into the cave via a wheelchair accessible elevator. Here, you will visit the large room of Jewel Cave which has a paved platform for guests in wheelchairs. A ranger will talk about the natural and cultural history of Jewel Cave and you will be able to view naihead and dogtooth spar crystals. I would recommend calling and making a reservation for your cave tour several days in advance. Reservations can be made by calling (844) 245-6179. After your cave experience, check out a ranger led patio talk. These talks are held close to the Visitor Center and are accessible as well. After your cave visit, grab some lunch in Custer and head south to The Mammoth Site of Hot Springs. This attraction is an active paleontological dig site with the largest concentration of mammoth remains in the world. When you arrive, take the 30-minute guided tour of the dig area where 61 mammoths have been identified, along with the remains of a giant short-faced bear, camel, llama, prairie dog, wolf, fish, and numerous other plant and invertebrate fossils. The tour is wheelchair accessible with sidewalks along the dig area. After the tour, take some time to explore the Ice Age Exhibit Hall and take the elevator downstairs for an up-close view of a working paleontology laboratory. 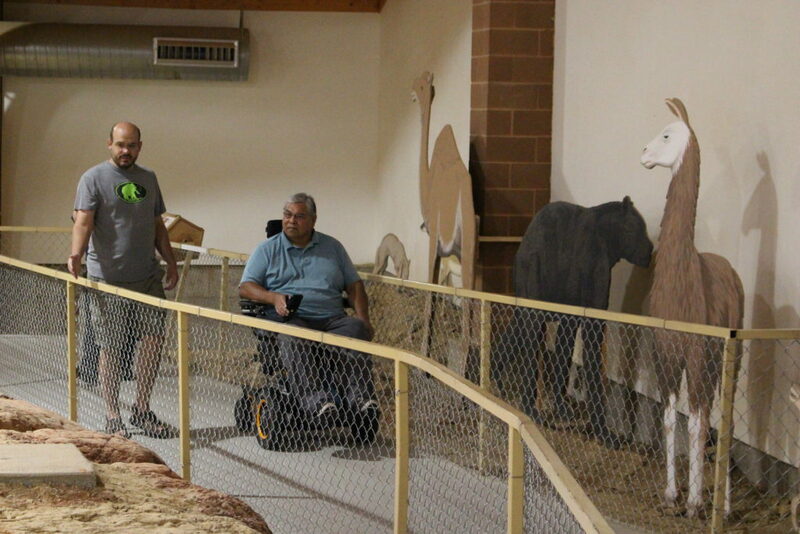 Accessible tour at The Mammoth Site in Hot Springs, SD. Finish your day by heading to Reptile Gardens, located just 6 miles outside of Rapid City on Highway 16A. Here, you will find the world’s largest reptile collection, stunning botanical gardens, tropical birds, and tortoises. Make sure to take in their three fun and educational shows: the gator show, snake show, and bird show. The grounds and buildings are all wheelchair accessible and the upper level of the sky dome has elevator access. Safari Room inside the Botanical Gardens. Day 4: Explore the rugged beauty of Badlands National Park. This 244,000-acre park is a wonderland of sharply eroded buttes, spires, and pinnacles. The Badlands is also home to a variety of wildlife, an expansive mixed grass prairie, and one of the world’s richest fossil beds. 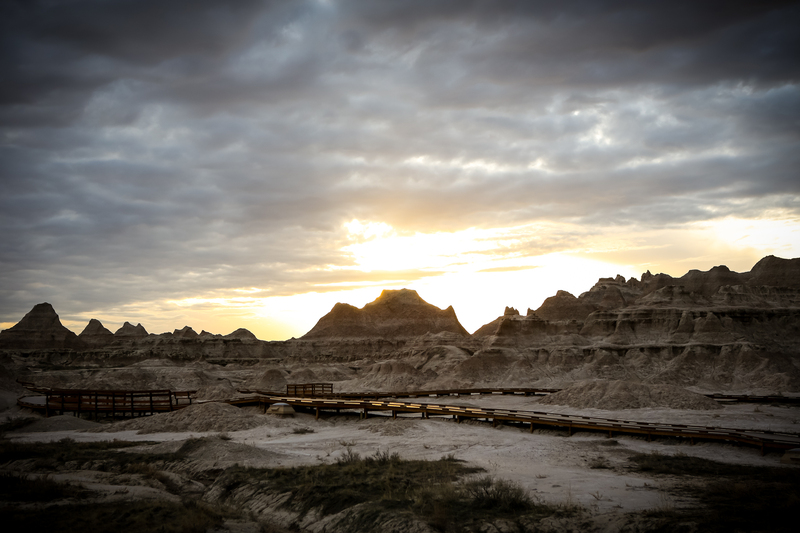 For the best views, get an early start, as the Badlands are most picturesque in the morning. Take the Badlands Loop State Scenic Byway (off I-90 at exit 131 or 110) and be sure to stop at the many scenic overlooks, most of which are accessible to wheelchair users with wooden boardwalks and gentle grades. Be sure to take the ranger led talk at the Fossil Exhibit Trail. This trail has a fully accessible boardwalk and features fossil replicas and exhibits of animals that once roamed the area. Next, stop at the Ben Reifel Visitor Center to learn more about the geology and paleontology of the Badlands. The Visitor Center features a wheelchair accessible theater showing an impressive film as well as educational exhibits with interactive components. After stopping at the Ben Reifel Visitor Center, grab lunch at Cedar Pass Lodge or pack a picnic and enjoy it at The Bigfoot Pass Picnic Area—which has reserved parking, ramps, and accessible vault toilets. After lunch, head out of the park to the town of Wall. On Main Street you will find Wall Drug Store. This is a great stop to get a souvenir, a glass of free ice water, or one of their world-famous donuts. Finish the day with a visit to the National Grasslands Visitor Center. Wall Drug Store has a large outdoor area for many photo opportunities. 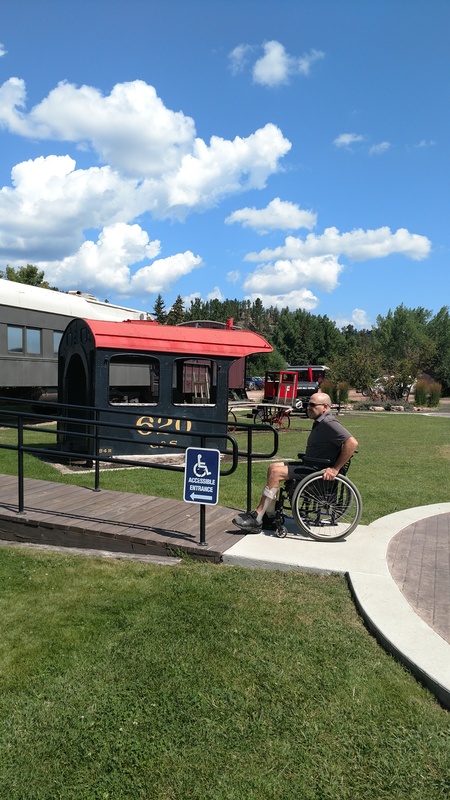 This itinerary is a great start to experiencing the Black Hills with a mobility impairment, but it only scratches the surface of all the fun and accessible things this region has to offer. The Black Hills offer hundreds of attractions, dozens of accessible trails, and countless outdoor adventures—so you won’t regret adding a few extra days onto you trip! Ara is a Black Hills native. Growing up just outside of Custer, her fondest memories involve exploring the Black Hills with friends, giving her a deep love for the scenic beauty, history and adventure that the Hills have to offer. Tourism has always been her passion, so she spent her college years at Black Hills State University in Spearfish earning her Bachelor of Science degree in Tourism Marketing. She has spent the past 14 years working for Black Hills & Badlands Tourism Association in Rapid City. Most recently, Ara likes to spend her time re-exploring the region with her family. Always seeking a new adventure, they love spending time outdoors, hiking, visiting area attractions and attending events.